I came across Henry Thornton, and the rise of the Clapham religious and abolitionist community as perhaps the first suburb reading Robert Fisher’s Bourgeois Utopias. In looking for more information I found this rather quaint book in the LSE library, copyrighted in 1964 and the first (only?) biography of Thornton, but it feels almost of another era in its reflections and open opinions on Thornton’s life and beliefs. 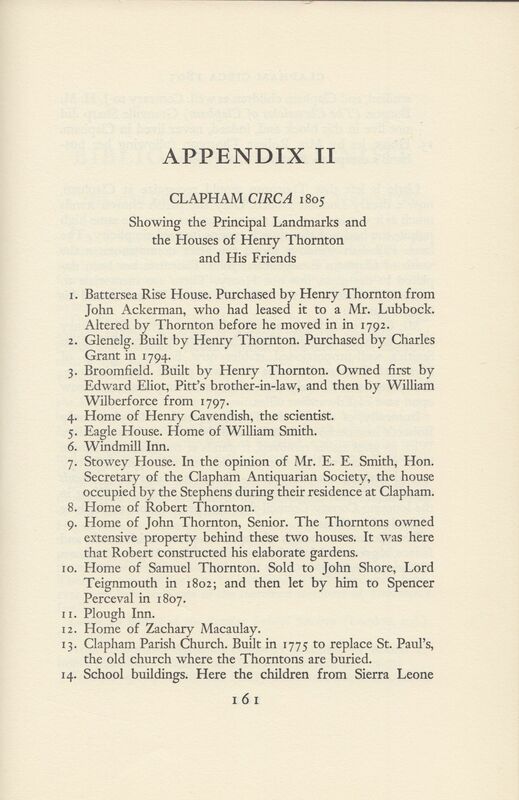 I was most interested in the growth of the Clapham group, how this contributed to modern ideas of home, city and suburb, and the involvement of religion upon these constructions, and those of gender roles. I found a very little of that, but so much more. I’m still reeling a little I think. His father, John Thornton, was an early promoter of the Evangelical beliefs. They are of the kind that I find frustrating and bewildering, where God is the cause of all things, and we are but his instruments, with a heavy does of predestination thrown in. So you could imagine young and earnest Thornton finding it slightly hard to get on in society. Novelist Fanny Burney writes ‘Mr Thornton, the new member for the borough, a man of Presbyterian extraction, upon which he has grafted of late much ton and nonchalance…was pleased to follow me about with a sort of hard unmeaning curiosity, very disagreeable to me, and to himself very much like nothing’ (26). For Wilberforce was welcome anywhere. A rich man, from a class above the Thorntons, he relished conversation with the London ton–an evening’s gossip with Grenville and Pitt, the rather more exotic chatter of Mme. de Staël (39). An interesting entry of class into the picture, as opposed to money. Still, the two became fast friends and worked together for the abolition of the slave trade. 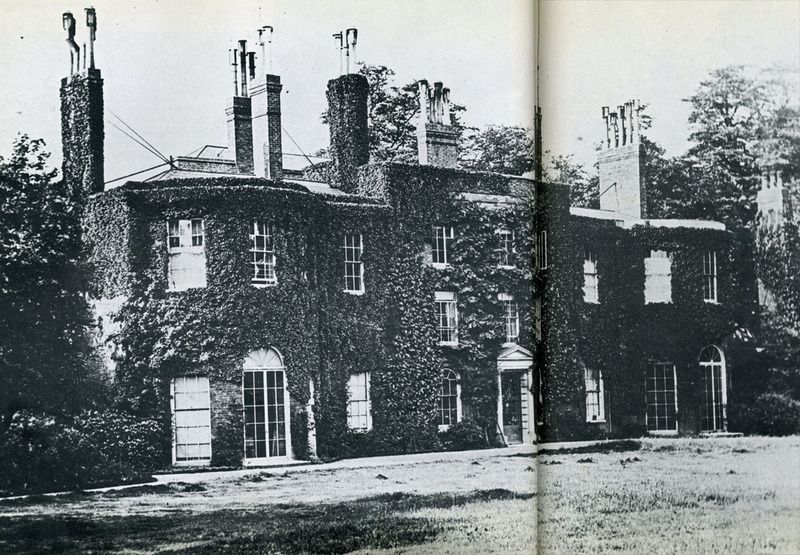 In 1792 they moved into Battersea Rise, a mansion next to Clapham Common. On the whole I am in hope some good may come out of our Clapham system. Wilberforce is a candle that should not be hid under a bushel. The influence of his conversation is, I think, great and striking. I am surprised to find how much religion everybody seems to have when they get into our house. They seem all to submit, and to acknowledge the advantage of a religious life, and we are not at all queer or guilty of carrying things too far (28, quoting from Henry Morris, Life of Charles Grant London 1904, p 200). 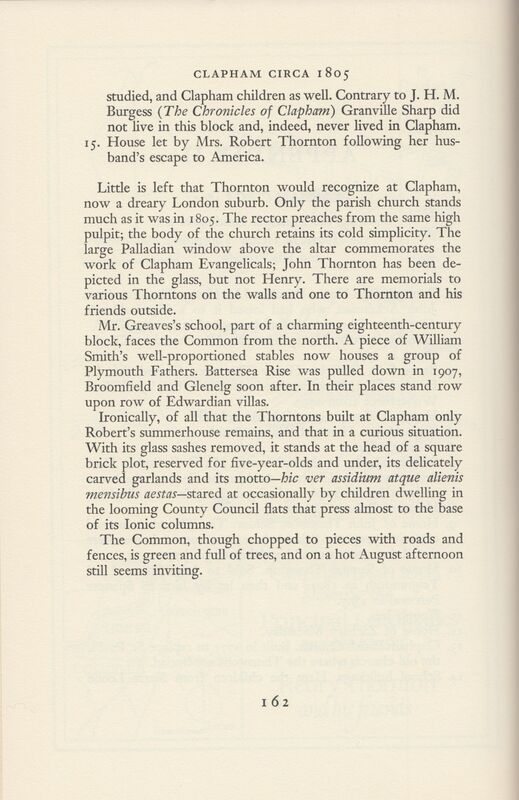 Clapham, five miles from the city, was a pleasant place to live. The great Common, until 1760 a tangled wilderness, now looked a vast and pleasant stretch of land. Paths had been laid and drains installed. But this was still the country. The parish paid a shilling bounty for every polecat killed, and fourpence for hedgehogs. Horse chesnuts and poplars grew to the edge of many of the ponds. On the north corner stood the parish church: large, solid, unadorned, built in 1775 with money raised by John Thornton. Big enough to hold 1400, by 1790 it was none too large. The 1760 village of 1000 now had a population nearly three times as great (32). Apart from renovating and adding two wings to Battersea Rise, Thornton built a second house, sold to Charles Grant in 1794. First a merchant in the East India Company and then on the Board of Trade, he joined the Clapham Evangelical community where his family would become one of the closest to the Thorntons. They were joined by John Venn, who became tutor to Grant’s children and later became rector of Clapham. James Stephens, married to WIlberforce’s sister Sarah, who became an abolitionist after working in the West Indies and corresponding with Wilberforce on the conditions on the plantations. Meachem states he became an Evangelical through his hatred of slavery rather than the other way round. Zachary Macauley, formerly a bookkeeper and overseer of a Jamaica plantation from age 16 to 20, became part of the circle (and would later become governor of Sierra Leone). John Shore, Lord Teignmouth also from the East India Company, would join them. William Smith, Charles Elliot, and John Hatchard, publisher, also joined them. In the wider circle were the Gisbournes, Babingtons and Hannah More, joined by a tangle of shared beliefs and marriages. 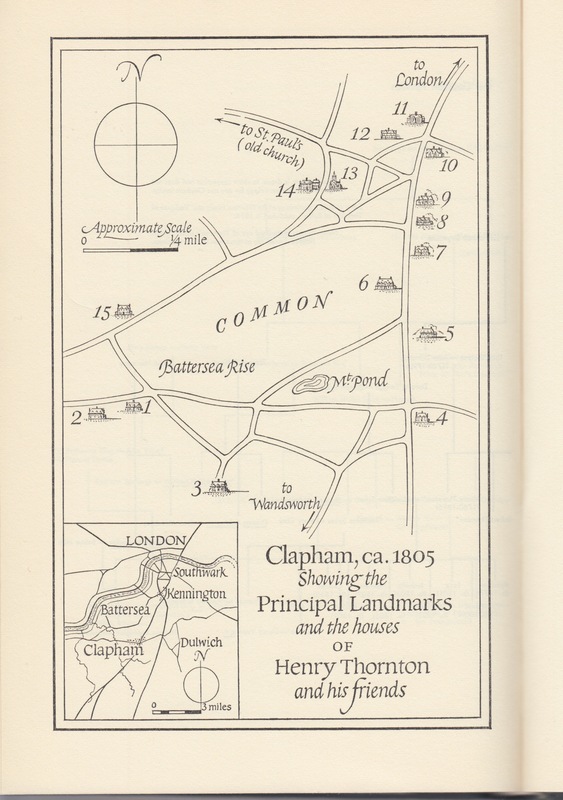 The book contains a brilliant map showing the Clapham Community and its members, along with a description of what is left — a little disparaging of Clapham as a ‘dreary London suburb’. These villas would form the basis of future ideals of the suburb, but at this time most of its residents still kept, or took on under the pressures of work, houses in town — King’s Arm Yard, Palace Yard, Kennington, Bloomsbury, Ormond St.
To promote the instruction of the African in letters and useful knowledge…to induce them to substitute a beneficial commerce in place of the slave trade; to introduce amongst them the useful arts of Europe… (Thornton to Zachary Macauley, 28 May 1806 SB p 34, 97). And abolish the trade they did. Thornton’s anxiety to better Africa and civilize the Africans equaled his concern for slaves and hatred of the slave trade. Sierra Leone showed itself the means by which that civilizing might begin, and Thornton, committed as he was to abolition, worked less for that than for the colony which he felt promised most for Africa once slave-trading had stopped. The Act of Parliament creating Sierra Leone Company authorized a court of thirteen Directors, and the Directors elected Thornton their chairman. They chose him as much for his ability as a banker as for his convictions as a Christian. Sierra Leone would prove their point–that Africa could prosper as more than just a market for humanity–only if the Company should show a profit. Thornton, it was hoped, would make the venture pay. The one attempt in pure colonial philanthropy, which Granville Sharp had made five years before, had proved a dismal failure. Sweet Jesus. I don’t even know what to say to either of those two attempts to create a settlement. Now, given a description like that (Who were the women? Why did they come? Who were the Black men? What the hell is happening here?) this clearly isn’t a book that will explore this story with much of a critical eye. I’ll be investigating more, so just a few choice details pulled from a chapter that hardly engages with what is really happening. Complication came almost at once with the importation of 1196 Negroes who had served in the British army during the American Revolution and been left to fend for themselves in singularly unsuitable Novia Scotia (106). It was a noble end–to make a colony remake men: an end, however, that was to prove maddeningly difficult to achieve (107). When Macauley retired as governor in 1799 he brought 30 children with him back to Clapham to be educated and returned to Sierra Leone as part of this end. The children had come to Marianne [Thornton’s wife] to learn their Bible and their manners, and they exasperated her. “My African girls have been a plague to me,” she complained to Hannah More. “I mean to send the worst back by the next ship.” The Society would have been wise to ship them all back home. There was nothing to teach them at Clapham that they could not learn at Freetown; hence little reason to pluck them up into cold England. For several years they remained a Clapham “sight,” playing on the Common, displaying themselves in the libraries of their benefactors. But climate took its toll, and one by one they died. In 1805 only six remained alive. It was a well-meant experiment, unmeaningly cruel (111). Climate my arse, this is the most chilling story I have read in a long time. My heart breaks at the thought of those poor children among people who looked down on them, even hated them, and still used them to raise money. I wonder where they are buried, how to make sure they are remembered and mourned. There is more to be found here. The untoward disposition which too many of the settlers have shown proves, but too plainly, the importance of bestowing on them an intelligent and protective government (108). Uniting great ignorance with a vain conceit of their own talents, and sufficiently disposed of themselves to regard the share, which Europeans had in the government of the Colony as an usurpation, they were easily persuaded that nothing would so effectually contribute to their happiness as the demolition of the existing establishment (28, 113). The insurrections kept on coming (hurrah) — especially after transporting a bunch of Maroons from Jamaica — and the Company became convinced the Crown needed to take over. Reading all of this I am still a little in shock that I had never heard of any of it. I knew of Thornton and Wilberforce as abolitionists, but this profit-making venture in Sierra Leone is the stuff of horror, nor did they step in when slavers were capturing Blacks in Sierra Leone and then making of them ‘identured’ servants, because indentured servitude was not illegal. The rich, however, would not be lectured. ‘Having tried them almost in vain” and tiring of cool looks and cold shoulders, the Evangelicals gave it up and taught the poor instead, who could at least be poked awake to hear a sermon. “while principles of equity, moderation, and benevolence prevail in a considerable degree among the higher orders of the people, it is much to be lamented that disorders of the most pernicious tendency pervade the lower ranks; and that reformation with repsect to them, has till late, been rather a matter of solicitude and desire, than of serious expectation” (130-131). Ugh. You throw in the religious beliefs about God defining our station — surely also applicable to the slavery, so I’m curious about how that worked intellectually — and you get a whole lot of initiatives offensive to poor people. Yet evidence and inclination suggested to Thornton one fact about the poor before all others: that though their lot might improve, they would stay poor…With it he accepted a corollary class system, static in rank, rigid in task. Education under such confining circumstance became instruction in the duties of one’s condition (140). God often punishes men by sending a real trouble. And the means which discontented people take, to better their condition, not seldom prove the occasion of the new calamity which overtakes them (143). the estimates of Evangelicalism commonly diverge. Historians agree it played a great part in shaping the Victorian mind. yet there agreement ceases. Some, following the lead offered by Samuel Butler or Edmund Gosse, discover little more than tepid piety, hypocrisy, self-satisfaction, and cruelty. Others, reading the lives of George Eliot or Beatrice Webb, find instead awareness of a moral code and conviction as to the duty of moral man within society. Both the bad and the good have their roots in the beliefs of Henry Thornton’s generation (153). I find it so hard to find a moral code and conviction worth anything at all in this recounting. Only by rigidly separating whites from Blacks, and removing actions towards non-whites (and poor people) from the same morality required in interactions with equals, does this make any kind of sense. How this double morality took life through the following decades — century even — is such a key question I think. And one to take sides on. Its power derived ultimately from the capacity of suburban design to express a complex and compelling vision of the modern family freed from the corruption of the city, restored to harmony with natured, endowed with wealth and independence yet protected by a close-knit, stable community…Where other modern utopias have been collectivist, suburbia has built its vision of community on the primacy of private property and the individual family. Suburbia has founded its hopes for community stability on the shifting sands of land speculation and based its reconciliation of man and nature on teh capacity to exclude the urban world of work which is the ultimate source of its wealth’ [x]. Here it is suburbia and suburban spaces as bourgeois utopias, but what I found most fascinating were its earlier religious origins in Clapham, and on class fears in Manchester. English society was still something of a caste society in the sense that social distance was so marked that the privileged felt no need to protect themselves further from the poor by physical distance. That the richest bankers in London lived literally surrounded by poor families did not in the least diminish the bankers’ status. One might even say that in a caste society the rich need the constant and close presence of the poor to remind them of their privileges’ . It is so interesting to remember that this relentless desire to segregate by race and class so clear in today’s society is a new thing, and taking this further, is partly driven by the fear and social unease emerging from revolution and ideas of equality — and the need to be protected from the poor. It is also driven by changing ideals of the family, a move to the nuclear family, more intense care and love lavished on children more likely to survive and as enjoined by evangelical religion. Or so said the ‘Clapham Sect’ led by the Thornton family and preacher William Wilberforce, and joined by their fellow religionists in building homes facing Clapham Common. This created the ideal of ‘houses in a park’ as opposed to the aristocratic rows and crescents of say Bath, and developed by architect John Nash in his design for Park Village alongside Regent’s Park. The older urban form involved the frequent and intimate contact of the middle and working classes. This closeness was precisely what the Manchester bourgeoisie had come to fear. they sought the most complete separation possible while maintaining the all-important contact with the information sources at the core’ . Thus Manchester comes to be described as the town where the distance is greatest between rich and poor — and this by the time Engels is describing it in 1848. 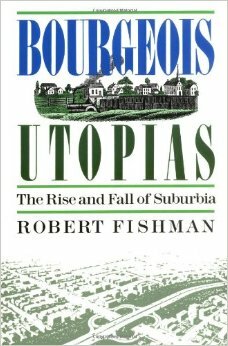 Here it is more clearly about both fears and ideals — and what I like about Fishman is that he never forgets it is also always about money: ‘The rush to suburbanize could never have occurred without a structure of land speculation and building that permitted and encouraged it’ . Because of the money involved, some insurance against the hazards of speculation were required, and one of these appeared to have been homogeneity, a way of preserving land from ‘less desirable neighbors or uses’ . It’s interesting how he compares these examples to the US and to France. France, of course, never experienced such flight of the wealthy to the suburbs because during this period Haussmann transformed Paris to build grand new boulevards and rid it of its poor, making the city a haven for the middle classes as the country was for England. the US of course, took it up wholesale, with Olmstead learning from Nash and the designers of Manchester’s neighbourhoods. But it is interesting that Fishman never applies the insight of class separation to the US, consistently writing about all ‘Americans’ having access to the suburbs through government financing when in fact it was only white Americans. Thus there is whole dynamic around race fear that he is missing in his description of L.A., even though he cites Crabgrass Frontier by Kenneth Jackson, published two years earlier. Still, this one of the earlier books on the subject, and does a good job of describing some of the more interesting cultural components forming the pull of the suburbs.